John Bradshaw Layfield is known for his razor-sharp tongue and being a straight-up bully in real life. JBL doesn’t hold back on his opinions and the latest name to have incurred the wrath (possibly alcohol-induced) of the former WWE Champion was Cody Rhodes. It all started with JBL mentioning a successful bet he made on the Cowboys before he went on a rant about Rhodes. It’s been a year since JBL stepped down from commentary duties on SmackDown Live to pursue his humanitarian activities. It's safe to say that the self-proclaimed self-made millionaire has been a polarizing figure in pro wrestling. Often accused of backstage hazing and bullying, Layfield’s surprisingly lengthy reign with the WWE Championship, however, cemented his place as one of the most despised heels in WWE history. JBL should be given credit for the rise of John Cena as it takes an equally solid heel to put over the face of the company. All the hate aside, JBL had a decent career, both in the ring and the commentary booth. He is currently focused on his business ventures and his role as a Beyond Sports Global Ambassador. He still seems to have the time to take direct shots at one of the hottest non-WWE talents in pro wrestling today. 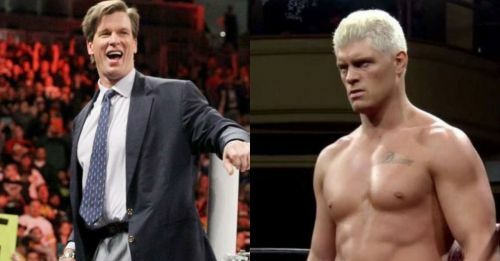 Rhodes has been constantly in the news for his backing of a proposed new promotion that intends on competing with WWE. Rhodes himself has teased a huge announcement in January which is billed to be ‘bigger than anyone expects’. Twitterati loves to stoke a fire and that’s exactly what happened when JBL took an unnecessary shot at Rhodes. The WWE veteran then went on claim the IWGP US Champion is nowhere in his league and that he would have even beaten his dad, the legendary Dusty Rhodes in a match too. This tweet was deleted by JBL. JBL should maybe tuck his phone away whenever he indulges in a few extra drinks while watching the Dallas Cowboys play! Anyway, we are not expecting JBL to come out of retirement for a match against Rhodes or any match, for that matter. We sincerely hope this Twitter feud stays in Twitter.